"Hays and Lauto captured nuance after nuance, detail after detail in phrasing, gestures, asides, hugs and hurrahs of Garland and Liza. Very impressive. ​Hays had plenty of persona down to bring us up to our feet to cheer"
"[The actors] are refreshingly right, sharp, loving, diligent, and spot on, without at all making the show seem like a dusty or conservatively cautious museum piece or veering into caricature." "Nancy Hays is a powerful Judy Garland as she opens the show with “Once In A Lifetime” and Liza is played to perfection..."
"The stunning ladies show all the emotions that one would expect from the real duo. In particular when “Judy, aka Nancy” does “Over The Rainbow”. Both of the ladies find themselves in tears (as did many of the audience members). This was a highlight as I felt that the real mother and daughter were expressing their true love for each other in a special and rare moment." ​"I defy anyone to see this show and not walk away with the feeling that they have just been witness to a trip down memory lane that will stick in their minds forever! These are two special talents!" "Garland is ideally embodied, rather than imitated, by Nancy Hays". "As Judy Garland, Nancy Hays is terrific. Returning to her theatrical roots, Ms. Hays has a fantastic, professional voice... Both eschew the temptation to play their iconic roles as caricatures, while still portraying the essence of these women. The mannerisms, the voices, the demeanor and charisma are all there". 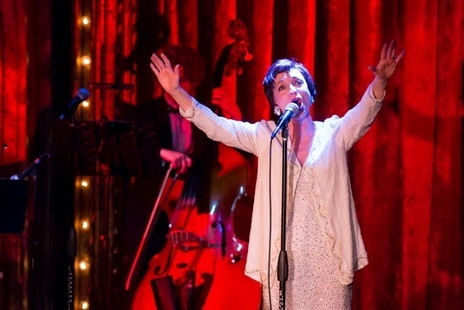 "Cabaret star Nancy Hays is sensational as Garland"
"Galvanic support comes from cabaret star Nancy Hays as a wonderfully convincing Judy Garland: Her hair-trigger vulnerability exposes the edge to every emotion". "Nancy Hays, besides bearing a striking resemblance to the real Garland, sings with the nervous, but defiant belting she is remembered for".